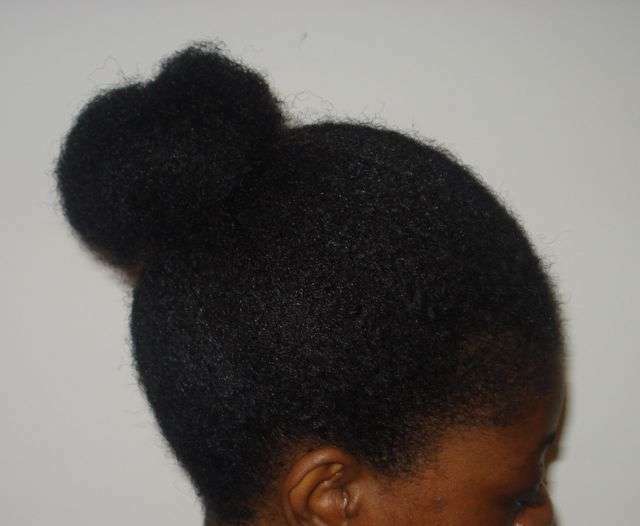 I went natural in 2009 after a terrible experience at a place that was supposed to be a “premier” salon in my area. The lady relaxed my hair, which didn’t take, then proceeded to blow dry and flat-iron my hair to within an inch of its life. I should have stopped her but she had “over 20 years” experience and was “highly sought after” so I figured she knew what she was doing. By the time she was done, I had an almighty headache that lasted all day. The after effects of that treatment lasted much longer though. I woke up for weeks afterwards with handfuls of hair all over my pillows. 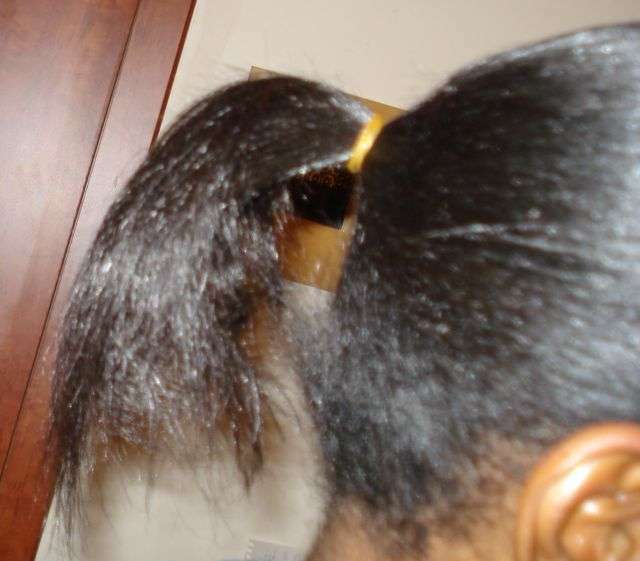 Below is what my ponytail looked like by the time the shedding was done. You can see I’ve also lost a significant amount of nape hair. I decided I’d had enough of salons and would no longer be relaxing or letting stylists near my head. I had no idea what I was doing back then but I learnt and over the years, I have become my own hairdresser. I’m currently in braids and have been considering going to a salon for a wash, condition and flat-iron for the first time since 2009 then I came across this scary story on Fusion. 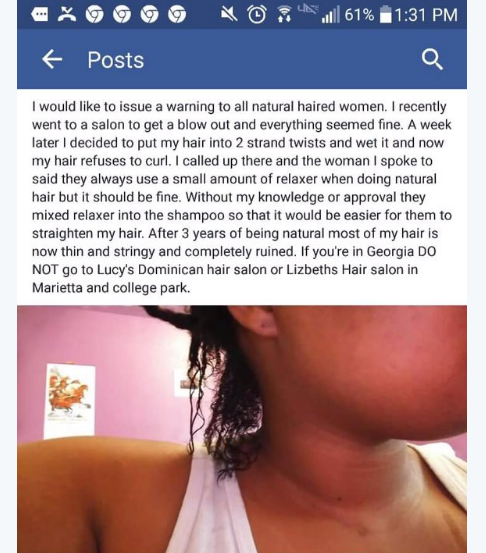 A woman with natural hair went into a salon for a blowout and they snuck relaxer into her shampoo without informing her. The salon has posted a disclaimer on their Facebook page saying they do not add relaxers to their shampoo. Nevertheless, this story is another reminder to figure out your hair on your own and learn how to take care of it. 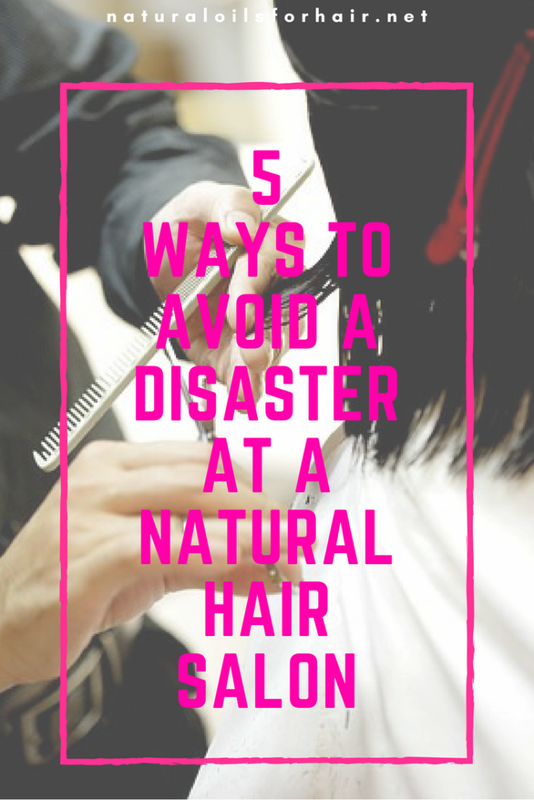 If you really don’t have the time and have to go into a natural hair salon, here are 5 tips you should follow to avoid a disaster like above. Do your homework and make sure it’s a place that comes highly recommended. Find some of their customers and talk to them about their experience; get a feel of the type of customer service they provide and if they listen to their customers. When you go in, make it perfectly clear that you are not interested in altering your curl pattern or looking for permanently straight hair solutions before they initiate any treatments on your hair. 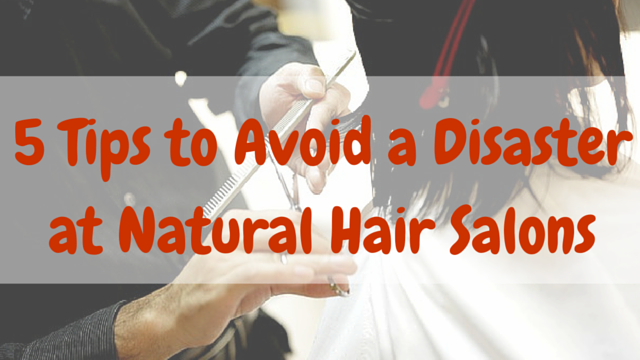 Go in with your own hair products and make sure that’s what they’re applying to your hair. Make sure you are facing the mirror the entire time so you can see what’s been applied to your hair. I get my braids done by a specific stylist at the same salon I’ve been going to for the last 6 years for it. She knows I’m particular (crazy) about my hair. I will not be straightening or relaxing it under any circumstances and I just want my braids put in without any side comments. The relationship is magical. I also go in with my own wide tooth combs, shea butter and hair clamps so nobody gets any ideas about sticking a tail comb in my hair. I remember this story. It was scary reading that. How can you just relax someone’s hair without their permission. I would have sued the salon, the stylist and everyone sueable! That’s why I do my hair at home and make my own shea butter mix to Naptural86’s recipe. In the salon they comb your hair like they have a vendetta against it. Your scalp is burning from either the overly agressive combing or they’ve burnt you with the pressing comb and they have the cheek to smile when you jump because you can feel the heat of the comb. I no longer press my hair. I love the texture and I trust no one except myself to style or wash it. Ikr. It doesn’t matter how thick or long or curly your hair is, they are obsessed with digging that tiny tail comb in there and fighting your hair with it. That’s why it’s very important for curly haired ladies to learn how to care for their hair themselves. No one can be as gentle with it as you can.